There is something so special about the moon. It’s one of those mesmerizing things that can stop me right in my tracks. I try to always appreciate it, but sometimes we get caught up down here in our own little worlds and forget just how magical the moon really is. Celebrate the moon and our place in the universe with some of these stellar (ha!) 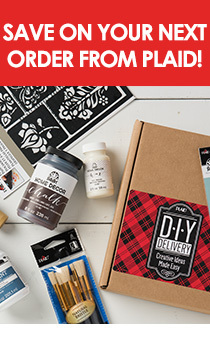 crafts and home DIYs. Whether you glam up a boring wall with some gold paint or throw a lunar party with your very own piñata, everyone has their own method of honoring the man in the moon. Here's some DIY inspiration for making moon magic of your own! Follow the phases of the moon (and use it as a way to teach kids about its waning/waxing ways) with this simple yet striking piece of DIY wall art. If you've ever used it, you know that FolkArt Home Decor Chalk gives an absolutely flawless finish to wood and will provide out of this world results! Guests will be amazed that you did this one yourself. So maybe you don’t have a starry party planned in the near future, but you could always make this piñata now and hang it in a corner for a little fun until you do. Who knows, maybe it will inspire you to turn your next Saturday afternoon into an impromptu party?! It might look a tad time consuming, but with the help of Mod Podge, it will be hanging amongst the stars in no time! I have a slight obsession with constellations. They're the art of the sky! Bring that art down to Earth and into your home with a DIY Constellation Light Display. This tutorial calls for black foam board, but if you can't find that or have other foam boards laying around, black FolkArt Home Decor Chalk will work just as well for creating your night sky. Bring it all together with a Mod Podge Mod Melter (basically a super sonic glue gun) and have fun lighting up your little universe. These glowing moon globes would look incredible inside or on an outdoor patio. Mod Podge works wonders when it comes to this kind of thing. Pictured at top: Gold Moon Wall Mural, tutorial at A Beautiful Mess.